This week’s regularly scheduled post isn’t going to happen (due to a confluence of personal events), so it’s a good thing I have a bunch of links saved up! Standard foot measurement information for sock makers. It’s written for knitters, but I see no reason why crocheters or nalbinders couldn’t make good use of it. Making frogging back to a previous row easier. Three crochet foundation stitches – I need to try all three! There’s at least one there I haven’t tried yet; I wonder how it would do as a knitting cast-on. From Vashti Braha, who is amazing. Tunisian Crochet Lace: New Habits Another Vashti post, about how Tunisian crochet doesn’t need to be worked densely. Loosen up! Some Tunisian Lace stitches. Not from Vashti, for a change. A basic guide to Bosnian crochet, which is a subset of slip-stitch crochet. This last month has taught me that translating my designs into written patterns is hard work. Fortunately, I have friends who are or will be acting as beta testers. One of them has gotten a good start on the whole thing, and has been doing a good job of knitting what I wrote, not what I meant to write. She’s also told me when my instructions are flat-out confusing. Very helpful! I’m also glad that I will be taking a class on designing and writing sock patterns at Sock Summit–I hope it will help me learn the language. Part of my problem is that I learned sock basics eight years ago, and haven’t used written patterns since. Furthermore, this particular sock has a very unusual construction, and so converting the abbreviated summary in my head (which partly uses a three-dimensional understanding of the structure, only not a visualization*, instead of verbal description) into something that someone else can follow is extra tricky. I think I have a decent draft of the trickiest bit, but we’ll see what she makes of it! *This is very hard to describe. When I “visualize” things, I often don’t “see” them in my mind. I have a kind of kinetic feel for spatial relationships instead. I was just about to post that I was making really good progress on one of my sock designs and that I’d finished half a sock, when I realized that I had half again more stitches than I should on the instep. Then I realized why, sighed, and ripped back most of the way. Fortunately, I had used a lifeline right before the critical row, and so it wasn’t hard to pick up the stitches again. 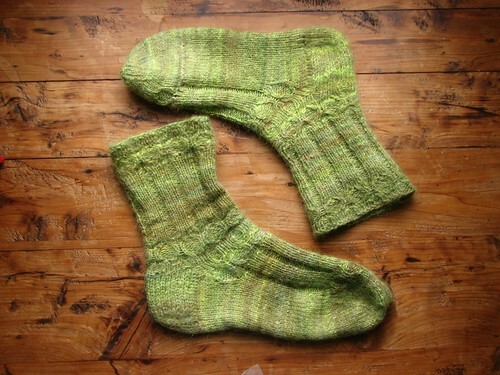 I’m now working on four different pairs of socks, which might be a mistake, or might not. We shall see. I’m also spinning up some lovely, dark brown Romney locks. I’m planning on making four-strand, cabled sock yarn. All of a sudden I found myself doubting how this sock that I’m knitting will come out. I stopped and thought about the oddities involved, did some math, and still felt dubious. Then I thought, “What’s the worst thing that could happen?” and decided to forge ahead with my original plans. If I have to frog some knitting and start over a bit, well, that’s part of designing! I’m pleased to say that my designing enthusiasm is continuing – now if only I can actually get myself to write things up! A while ago I also started to write up the pattern for some other finished socks, and I need to sit down and finish them. It’s very easy to see what the bottleneck is!